Buy your chickpeas from an indian shop, they're much bigger and softer than the supermarket ones. 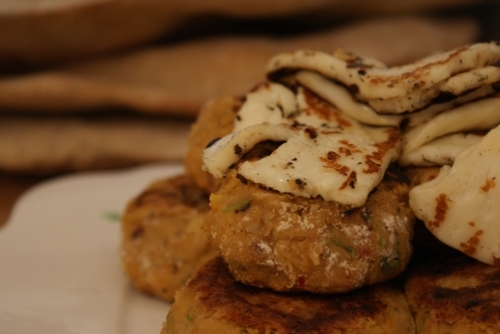 These little cakes are a delicious alternative to falafel, especially with some haloumi on top. Serve with pitta, yoghurt, salad and a simple tomato salad. Fry the onions in a little oil for a few mins, then add the garlic and chilli and fry for a few mins more. Add most of the chickpeas, reserving a couple of tbsp. Stir well and season. Blend until smooth, stir in the chopped coriander, lemon zest and tahini. You want the mixture to be quite stiff, so add a dusting of flour if its too sticky. Pour some into a shallow bowl at the same time. Take large tablespoons and shape into balls, before dipping into the flour to coat, place onto a plate. Repeat with the rest of the mixture and chill for 30mins. Fry the cakes in a little oil for 3-4 mins on each side until golden brown and warmed through.